Dr. Paul A. Lapchak has received his PhD in Pharmacology in 1988 from McGill University (Montreal, Quebec). Currently, he is the Director of Translational Research at Cedars-Sinai Medical Center in Los Angeles, CA. Prior to joining Cedars-Sinai Medical Center, while at the University of California, Dr. Lapchak advanced 2 embolic stroke models to develop new stroke treatments. He is currently serving as an editorial member of Translational Stroke Research and is an active reviewer for STROKE, Experimental Neurology, Brain Research, amongst others. He has authored over 100 peer-reviewed research articles, over 40 review articles and is currently co-editing a new book entitled Translational Stroke Research: From target selection to clinical trials. He is a member of American Heart Association and the Society For Neuroscience. 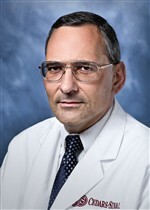 He has been honored as a Fellow of the American Heart Organization (FAHA) for his dedication to the translational development of novel methods to treat acute ischemic stroke and hemorrhagic stroke and has also received a Chemical Industry Award honor. Dr. Lapchak currently directs a translational stroke research laboratory funded by a translational research grant from NINDS. Dr. Lapchak is focused on developing natural product analogs to treat ischemic stroke. Natural products derived from plants and other natural sources are an untapped resource of bioactive compounds. The emphasis is on polyphenolic compounds such as curcumin and high affinity curcumin-derivatives with novel mechanisms of action and low toxicity profiles. Moreover, his laboratory is actively engaged in studies to further the development of transcranial laser therapy to promote recovery of function following a stroke by elucidating the mechanism of action of light therapy. His laboratory is also working to develop new methods to attenuate thrombolytic-induced intracerebral hemorrhage and provide neuroprotection to hemorrhage patients.